With a custom order you have the ability to add a contrast pipe, ruffled skirt or even cover one in your own fabric to create a true statement piece. The possibilities are endless and lead time is generally 6 weeks. To view the entire Little Castle collection and find a location near you click HERE. This is almost the same glider at 1/2 the price, and I'm highlighting the word ALMOSTbecause it is definitely not the same. 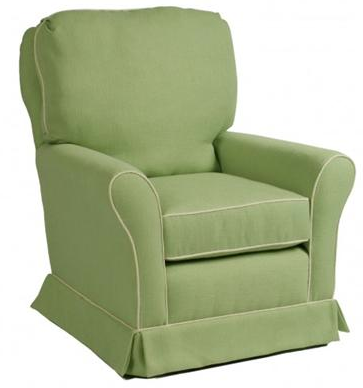 Yes the glider is made by the same wonderful manufacturer Little Castle and is very similar in size but this one sits lower to the ground and you don't have a large selection of color choices. The color notes that it is navy and white but in person this is definitely not navy. I have had clients whom I have consulted with refuse the package at the door once they believed me and saw the color. If you are looking for more of a faded blue, almost more like denim color then this is perfect for you. But if you want navy, this is not navy. But the quality is the same and they do have quite a few different color options in other styles. So yes you can find a cheaper quality alternative at Target but you don't have a large fabric selection. Any chance you've found similar glider's in white? The Pottery Barn models are about the same price as the Little Castle ones. 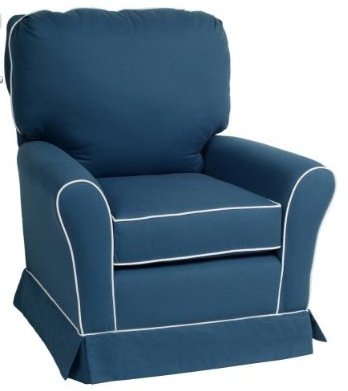 I found a great deal on my glider at www.royalbambino.com they have options to customize and select contrast piping on a different fabric and also free shipping. I shopped around for the best price on a Little Castle Glider and found the best deal with free shipping. I choose a neutral fabric and I am very happy with my choice.